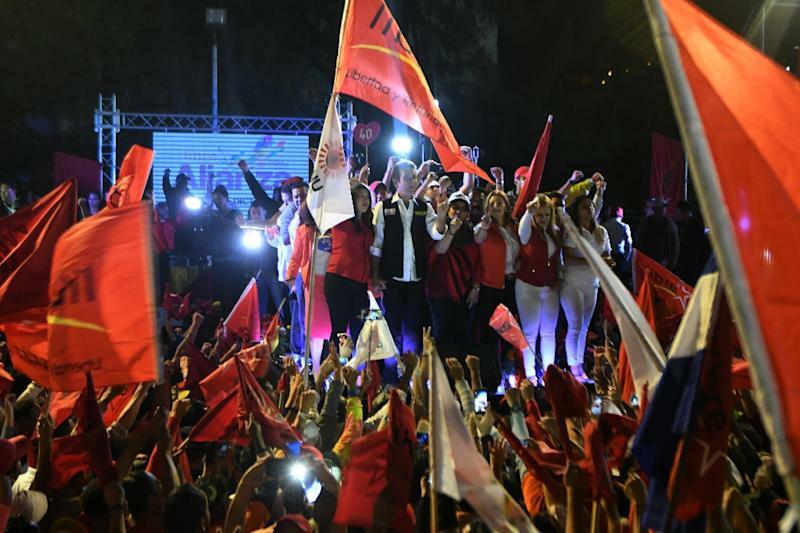 Tegucigalpa (AFP) - After a first term during which he hit back at violent gangs terrorizing much of Honduras, President Juan Orlando Hernandez is seeking re-election on Sunday with promises to cement the security gains and attract investment. His bid has drawn unease, however, not least because it was only made possible by the supreme court two years ago overruling a ban in the constitution on a second term for presidents. His two main rivals, Luis Zelaya and Salvador Nasralla, accuse him of preparing electoral fraud on Sunday through his sway over key institutions, including the electoral tribunal, the agency in charge of voter identification, and the police and army. Some 30,000 members of the security forces are deployed in the poor Central American nation to guarantee candidates' and public safety leading up to the vote. The armed forces implied a connection between the feared gangs and the political opposition in a statement saying troops on Saturday had found weapons, "manuals on terrorist actions" and flags belonging to "a political institution" at an address in Tegucigalpa used by the feared Barrio-18 gang. Hernandez, 49, has put security and combating poverty and unemployment at the center of his campaign, responding to priorities held by Honduras' 8.6 million inhabitants. "I consider a second mandate to be a moment of consolidation," the conservative leader said Monday in a speech broadcast by state television. He said he held a lead of 15 to 18 points over Zelaya, a 50-year-old academic heading the leftist Liberal Party who is his closest rival. Nasralla, a 65-year-old former journalist who is the pick of leftwing Opposition Alliance Against the Dictatorship, is believed to be in third place. Six other candidates are in the race, but are not seen with any real chance of victory. Voter opinion polls are banned months ahead of elections in Honduras, meaning no up-to-date survey results were available. There is also a ban on campaign rallies five days before elections. That restriction came into force at midnight on Monday, local time. In his last rally on the weekend, to a crowd estimated at 30,000, Hernandez said: "You have already made me president once... and next Sunday night I am going to return as president of Honduras." He vowed to roll back insecurity and unemployment, tackle the poverty that the World Bank says affects more than 60 percent of the population, and boost investment infrastructure. In an opposition rally, a crowd of thousands yelled "Out JO," using Hernandez's first initials, interrupting Zelaya as he promised to implement "an economic model including opportunities for all." The election Sunday will also be to choose the 129-seat single-chamber legislature. Hernandez's National Party has 52 seats in the outgoing National Congress, ruling in coalition with two other minor parties. The main opposition leader is Manuel Zelaya, a former president who was ousted in June 2009 by the army and elements in his own Liberal Party, with backing from churches and businessmen. He was removed because of fears he wanted to bring in Venezuela-style socialism -- and get rid of the one-term presidential limit. He now leads the Opposition Alliance Against the Dictatorship, which is behind Nasralla's campaign.